US$ 1310 / person ? 1 Arrival, drive to Thimphu Arrival by plane to Paro airport and drive to Thimphu or in case of arrival by land, crossing border from India in Phuntsholing/Jaigon and full day drive to Thimphu. Visit of Tashicho dzong, the castle, which serves as seat of the king and government. If time permits, visit of the other sights. 2 Thimphu – Wangdue Early morning drive to Buddha Dordenma, the gigantic statue of Buddha overlooking the valley and walk to striking city viewpoint. See Memorial Chorten, always busy with devotees. Walk in Norzin lam street and see the traffic police signaling in junctions. Thimphu is only capital in the world without the traffic lights. Finish walk at handicraft market where many interesting Bhutanese souvenirs can be seen and bought for reasonable price. Visit hand paper factory and Thangkha painting center, where young artists learns the skills of their forefathers. Then drive to Changankha lhakhang, the oldest place of worship in the valley. Alternatively cut previous program short and explore the Thimphu town on your own. Transfer to Wangdue or Punakha over Dochu-la pass (3010 m) with visit of royal temple Druk Wangyel lhakhang. 3 Wangdue – Gasa Short walk to Chhimmy lhakhang temple, devoted to 15th century saint Drukpa Kunley, know as “Divine madman”, who did taught Buddhism by singing, drinking and rampant sexual behavior. If time permits, also visit Sangchhen Dorji Lhuendrup Lhakhang nunnery with Bhutanese and Nepali style stupa, overlooking the valley from the high hill. Visit of Punakha dzong, which counts as the most intricately decorated castle in the kingdom. Drive to Gasa famous for it's hot springs, where you can wash your body in roofed pools. Overnight in farmhouse in Gasa as guest of local family. You can taste local delicacies, butter tea or ara spirit. 4 Gasa – Wangdue At the morning you will visit Gasa Dzong which dates back to 17th century and used to be important part of defense against Tibetan incursions. Stunning views of snowy peaks, especially Kang Bum (6550m) might be seen in clear weather. Then drive back down to Punakha. 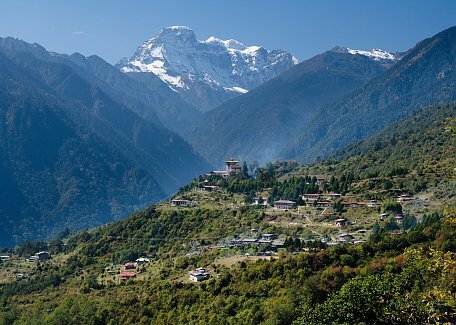 On the we we will stop to make 1½ hike to Khamsum lhakhang with stunning views of the valley. 5 Wangdue – Haa Early morning drive to Dochu-la pass (3015m) where we will visit Druk Wangyel lhakhang, temple dedicated to 4th king of Bhutan. In clear weather, we can see panoramic view of the peaks on the northern border of the country, including the Gangkhar Punesum (7540m) highest peak not yet climbed by human. You might even see the Gasa dzong as a white dot in distance. After this we will descend to to Thimphu and will continue drive to Haa valley. On the way we can shortly stop to see 15th century Dobji Dzong castle monastery, which is said to be first building of this design ever built in Bhutan. 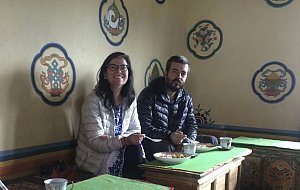 Accommodation in local farmhouse and visit to main village temple, Lhakhang Karpo (white temple) dedicated to local deity. 6 Haa – Paro In the morning visit to main village temple, Lhakhang Karpo (white temple) dedicated to local deity. Then drive to Katsho village and undertake short hike up to Juneydrak hermitage. This small temple perched to the rock cliff is considered to be “second Tiger’s Nest”. The last section of climb to this temple is very steep and you might need a support of rope which is fixed here. Place is inhabited by two welcoming hermits who will take you around. Then drive to Chele-la pass and picnic lunch there. In clear weather you might see Kanchenjunga mountain to the west and holy Jomolhari peak to the north. Descend by car to Paro. If time permits, visit also Dzongdrakha lhakhang, the temple built below the rock cliffs with great view of rice fields of Bondey village. The beauty of this temple, rarely visited by travelers, is only matched by the Tiger's Nest. 7 Paro Visit of the National Museum and Paro dzong (Rinpung dzong), the castle-monastery where Bernardo Bertolucci’s Little Buddha film was shot. The pristine Kyichu lhakhang is one of the two oldest temples built in Bhutan. Climb to Taktsang gomba (Tiger’s Nest), is the highlight of the tour. While the hike seems to be hard, it’s very rewarding. If you don’t feel so strong, you can climb just halfway to cafeteria with nice view of the place. You can consider hiking in the morning or early afternoon depending on weather, your fitness and preferences.